Together with launching their new Amazon Kindle HDX tablet and an updated Amazon Kindle HD, Amazon yesterday also announced the launch of their new customers service support named Amazon Mayday. Amazon Mayday will allow Kindle owners to access Amazon customer support experts and also allow them to virtually guide them through a question via a live video feed. 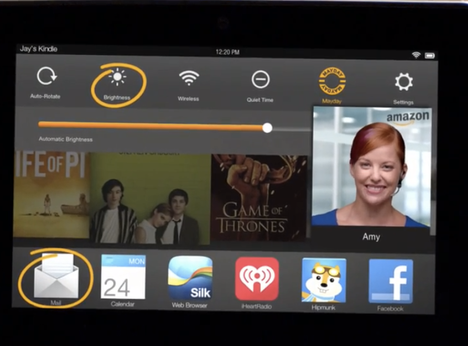 A new Amazon Mayday button has been placed in the devices’ Quick Settings menu, which when pressed allows an Amazon representative to access your new tablet to provide help, and guidance or take control of your device and fix issues right in front of you. Users who use this service will see the Amazon Mayday support person via a video feed on their tablet but the support rep cannot see the tablet owner at any time, only the tablets screen to trouble shoot. The company is expected to launch a wide scale advertising campaign for their new Amazon Mayday support service very soon.